I know other moms who have received these treasures and mostly we laugh together over the outrageous things kids say about us. Like when they get our names wrong (!!!) or guess that we’re either 15 years old or 100, weigh somewhere around 40 pounds and are 20 feet tall. This year, my kindergartener probably came the closest to giving all the right answers. What do I love to do? Read books. What is my job? Writing books and playing the piano at our church. Sometimes my other daughters got it right, too, painfully right in some cases. Ouch. This is the girl I’ve had to apologize to before because I had fretted and worried over foolish competitions and comparisons and she felt pressure from me when I’m really so proud of her as she is. One year on that same assignment, this daughter wrote that I always said, “I love you.” A year later in her little pencil scribbles on the paper, she wrote down how I always gave instructions. Why is it so hard to make the words, “I love you” ring truer and louder than the drill sergeant commands of everyday necessity? Yes. Isn’t that what smashes down all of my hold-it-together personal strength? Isn’t it what makes me grumpy, short-tempered and anxious? When everything is out of control….. and I forget that God is in control…. yes, that’s what makes me “mad.” That’s what God uses to plow right through my heart and break up all of that well-tended ground covering over my insecurities and my deep-down sin of misplaced trust. Kids can be so wise. As I hold this year’s Mother’s Day gift, I wonder what would I say about God on a worksheet like this? Would I get it right? Not giving the dictionary facts or the Bible study answers. Not the good church girl responses or the pat Christian phrases that tie Mighty God up in neatly packaged paper with a perfect bow on top. No: Would I know Him? Would I know His heart? What makes Him happy? What makes Him mad? What do I love about Him the most and why is He the perfect Father for me? Or would I get it all wrong? In the book of Job, one man lost family, friends, servants, status in the community, riches, property, and physical health. Without sinning, he questioned God. Why this seeming injustice, he wondered, why this tragedy and pain for a righteous man? His friends got it all wrong. They thought they knew God, boxed Him up into super-spiritual-sounding cardboard. Yet, God remains silent. He waits. He listens and doesn’t answer. Finally, after almost 40 chapters of Scripture, God speaks. Instead of focusing on the Why’s of our life circumstances, God calls our attention back to Him and reminds us of the Who that controls everything (p. 37). That’s God’s answer to the incessant questions. He never answers “Why,” but He tells who He is in one thundering declaration after another of His sovereignty and power over all creation. It isn’t until the taking away, the sorrow, the mourning and the grief that Job doesn’t just know about God; He knows Who God is. Job says, “I know that you can do anything, and no one can stop you” (Job 42:1). 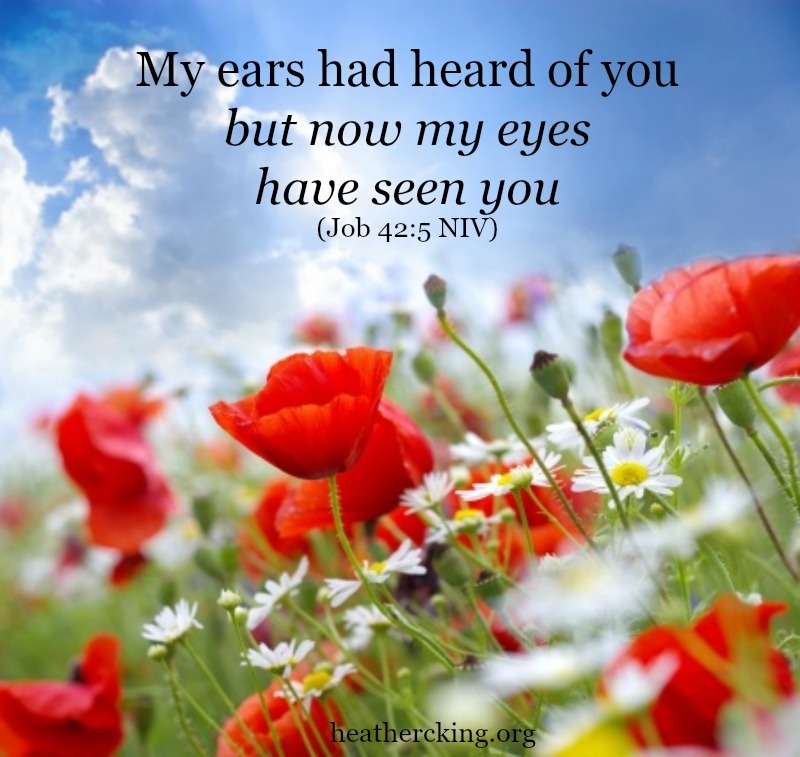 Yes, now he knew, not about God, but now He had seen God with his own eyes (Job 42:5). We also find intimacy in the silence. We form intimacy in the listening, the waiting, the mourning, the times when we can’t trust the circumstances, but we can trust the heart of God. That’s how we learn the “Facts About God,” the binding truths that we cling to when life obscures our divine vision. I love this image and verse. May I share it?